with the speed of Zeus. From the forthcoming collection, Walking with Scissors (Kelsay Books, 2019). This poem first appeared in The Broadkill Review. 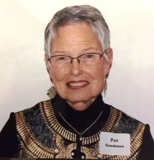 Patricia L. Goodman is a widowed mother, grandmother, and great grandmother. She is a retired horse breeder and teacher and now enjoys singing, gardening, writing, spending time with her family, and she has recently become involved with musical theater. 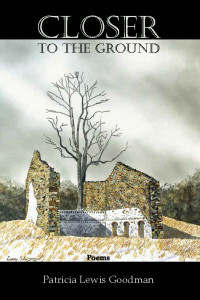 Patricia’s first book, Closer to the Ground, was published by Main Street Rag. Her second book, Walking with Scissors, is due out next year from Kelsay Books. Patricia lives in Delaware. Lovely imagery and use of comparisons. Captures much about herons. I used to watch them from a cottage in northern Minnesota. I have a great love of herons. And loved your poem. Thank you very,, very much Patricia. Love "symphony in silver" and "prayer-in-the-air." One of my favorite Pat. I especially like the the last two lines, but there are so many wonderful images. WOW! Symphony of silver! And what a sweet symphony of language. Thank you! I will never look at a heron in the same way again. Dear Patricia. As one who lived on Hatteras Island for some 28 years, I do know the Heron and the Egret. They were visitors on our dock for all that time. How lovely you have described them here. Thank you. What beautiful images and language, Pat! You captured the heron with your words.